Casa los Amigos, recently completely remodeled using the same architect and design team as Villa Rosetta, has quickly become one of Sayulita's premier vacation rentals. 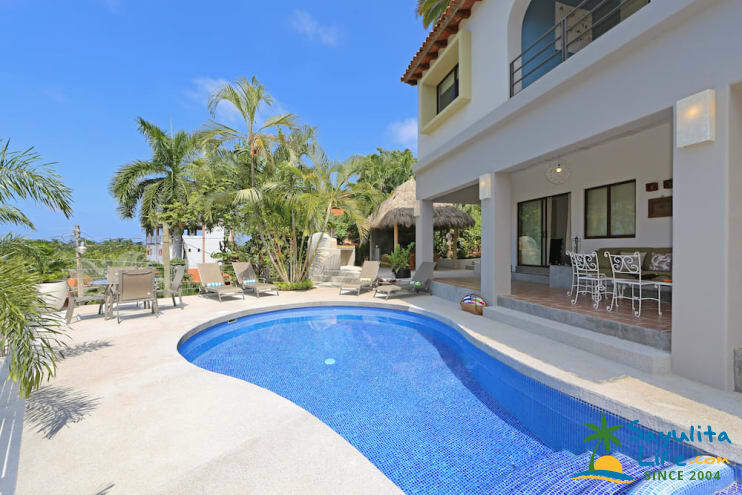 Featuring four bedrooms, each with a separate entrance and ensuite baths, a beautiful and modern palapa covered kitchen with amazing views, a saltwater pool and a poolside kitchen with a large BBQ grill and pizza oven. Just two short walks to the beach and left surf break, this homes has everything you need to complete your perfect Sayulita vacation. Nestled on a corner lot with a sweeping view of the ocean, village, and surrounding mountains, Hacienda Los Amigos offers guests an ideal location to experience the ambiance of Sayulita. Walking just two blocks down a Mexican lane, past the local school, ends at the beautiful north beach. A short five-minute stroll leads to the village center with its many restaurants, shops and surfing beaches. This centrally located villa is truly the perfect location to enjoy Sayulita at its fullest, close enough to easily walk but far enough to avoid the bustling dowtown noise. The large, beautiful saltwater pool has a shallow area at one end, perfect for the young guests. Enjoy the sun while lounging on the comfortable pool chairs, or relax under the covered terrace for a little breezy shade time while enjoying the surrounding gardens. Chito, our caretaker, maintains and checks the pool daily. He also cares for the garden that features a variety of palms, banana trees, bougainvilla, and other native plants. What’s included: Filtered water in the upstairs kitchen. Staff service everyday except for Sunday (As ex-mayor of Sayulita, Chito’s knowledge of the town is a great source of information for first time guests.) Boogie boards. Surfboards. Beach chairs. Umbrellas. Beach coolers. Beach towels. Drinking water. Ice. What else do you need? Hacienda Los Amigos makes the familiar Mexican expression, “Mi casa es su casa”, come alive. 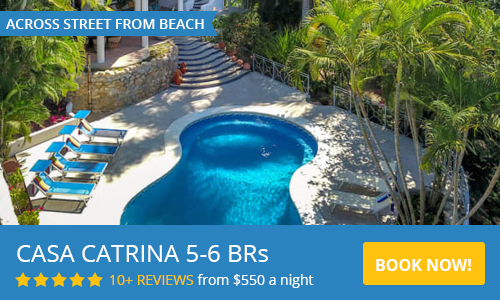 This popular family owned luxury rental villa offers guests the opportunity to have a truly memorable experience in the quaint little surfing/fishing village of Sayulita. We stayed there as two families of five and it was wonderful. The rooms are private and each have their own bathroom. The rooms are beautiful and clean. Amazing view! Perfect distance to the beach and town! 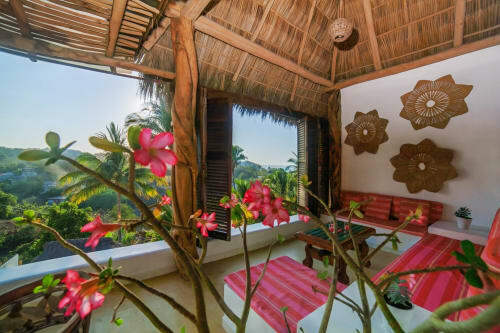 I would highly recommend this home to anyone staying in Sayulita! I miss this home so much already! What a beautiful house, so close to the beach and the restaurants. We stayed there with 5 kids and 8 adults, there was more than enough space for everyone. Highly recommend this casa to anyone. We visited this casa in January 2019, with a family of 10 & found it very comfortable for a large group. The rooms were really clean, Maria came in daily to tidy up. Chito was also there daily to refill pool & keep it clean. The grounds were impeccable. Location was really close to town, walking distance for even the tiny ones. What was great that it was far enough removed so that you didn't hear the noisy music at night. Lots of really good little places to eat breakfast lunch or dinner just within a few blocks. The great thing was that the kids really enjoyed the pool & the pool toys. Adults could hang out & still be able to watch all the fun. I highly recommend this rental. We stayed with our extended family and the house was the perfect setup for a big group. The location is excellent and it made coming and going very easy. The staff were amazing and checked in on us a few times a day. Kerry was very quick to respond to any questions and make sure that we were looked after. Beautiful home in a great location. Short walking distance to town and to the beach. Gorgeous view. Stayed here with another family. Plenty of room. One of the biggest pools in Sayulita! We had an amazing time in Sayulita and the house was exceptional! Casa Los Amigos is located very close to both the beach and downtown Sayulita. Our group had a great time hanging in the pool throughout our stay, the rooms are very clean and well kept by the staff, and we couldn't have asked for better communication from Kerry (the owner). The kitchen on the 3rd floor has such an amazing view as well! We definitely hope to return here on our next trip to Sayulita! Ideal location! The perfect house! This house was amazing! With eight people (two to a room), this place was ideal! We’d rented the entire home and space was never an issue. As the planner of the group I had kept everyone in the dark until we’d gotten to the house. Everyone was exceptionally pleased and couldn’t believe the price considering we were there for four nights. Kerry and the entire house staff were very polite and friendly. 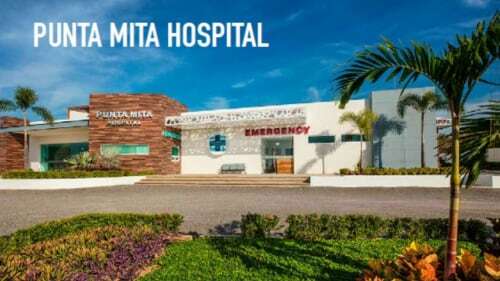 My friends and I had very long days and nights and never felt uncomfortable or unsafe either in the house or in the town of Sayulita. We’d taken the recommendation and had a team of people make us dinner there at the house. Hecho Con Amor created a wonderful four course dinner that was held on the second floor patio our home. Just before that we enjoyed a beautiful happy hour, poolside in the outdoor kitchen. The place was amazing! Highly recommended to any group and we will definitely be back! The house was nice. Pool was great for the young ones. Staff was very nice and diligent. Location was perfect. Close to town,beaches,shopping. Only negative was the WiFi didn’t work . Another great stay at Los Amigos! We stayed here for the 4th or 5th time over thanksgiving and once again it didn't disappoint! House is perfect for two families, pool is so great for kids and adults. So relaxing and easy walk to town and shops. We will return again and again! Sleeps 8 adults plus an extra bunk in one room and a day bed in another for extra kids. Christmas/New Year; Thanksgiving; Spring Break/Semana Santa; Presidents' Day: $625.00 per night. *Minimum 7 night stay during high season, 5 night during lower seasons. Maid service EVERY DAY except Sunday, the pool and gardens are checked and maintained daily.